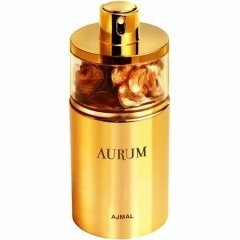 Aurum is a popular perfume by Ajmal for women and was released in 2011. The scent is floral-sweet. It is still in production. A spray and I think I find myself in a mountain of freshly washed, super-power washed and just removed from the washing drum. I feel like the three footballers in a current German advertisement for fragrance pearls as a washing additive, who actually want to take off their jerseys and just barely make it to the nose, but then get stuck in the fresh laundry scent so to speak. This impression of fabric softener scent seems to me to be taken from the beginnings of my "softening knowledge" when I was a child. So "the" one and very specific fragrance and in color rich light blue. Not like today, where every conceivable aroma can be purchased as softener. It is the classic, fresh and simply blue juice, which you inhaled with your soul and enjoyed the fresh laundry as long as possible. Usually the whole block smelled like it and even later, when the blue was replaced by other fragrant competitors, one always knew who had just washed in the house. Simply with the original note. The impression from the beginning right after spraying lasts a moment, then ambergris and raspberry slow down the slightly pungent note. Nevertheless, the fragrance remains intense. It can rebel in the head and is therefore not suitable for every nose. Especially not for those who do not like opulent and densely woven floral scents with a fruity impact. Powdery and vanilla and with a dash of jasmine, the fragrance is gradually refined to a trace, so that it becomes a little rounder and the stinging end is removed from the beginning. But he's still strong. It remains in this phase from about a quarter of an hour. It will never fade completely. He keeps himself with all the strength of his scent molecules on the surface on which he has been sprayed and so a test cloth still smells days after to dispose, my sleeve still reminds me of him and he is even so anchored in my head that I feel like a piece of chocolate or a fruit tart. A little and cunning seducer is the! Ajmal Aurum is fierce, demanding and challenging at the same time, strong flowery and fruity and should be used with care. Here again it is worth sharing...the sharing of individual drops to their minimum, because even so the fragrance will still be able to seduce long enough. After all, one Casanova is enough and you don't need an army! I feel like I'm being served a jar. It contains light blue and viscous liquid. In it is a filigree little spoon decorated in gold, with which I should stir the liquid. Carefully I let the spoon move around in circles and the more I do that, the more it suddenly draws golden traces behind it. Curious and fascinated I accelerate the stirring and the gold color runs more and more through the blue until it has finally taken it over completely. Write the first Review for Aurum!